Manti, also manty, mantu, mantou, or manties are a type of dumpling in Turkish and various Central Asian and Caucasian cuisines, closely related to the east Asian mantou, baozi, and mandu. Manti dumplings consist of a spiced meat mixture, usually lamb or ground beef, in a dough wrapper. It is either boiled or steamed. Left: Armenian manti served with thick sour cream. The word manti is used only in plural, referring to the collection of dumplings on a plate or in a pot. Manti were carried across Central Asia to Anatolia by migrating Turks in the Chingizid-Timurid periods. Turkic and Mongol horsemen on the move are supposed to have carried frozen or dried manti, which could be quickly boiled over a camp-fire. Manti are popular throughout the former Soviet Union, where the dish spread from the Central Asian republics. In Kazakh cuisine, the manti filling is normally ground lamb (or beef or horse meat) spiced with black pepper, sometimes with the addition of chopped pumpkin or squash. 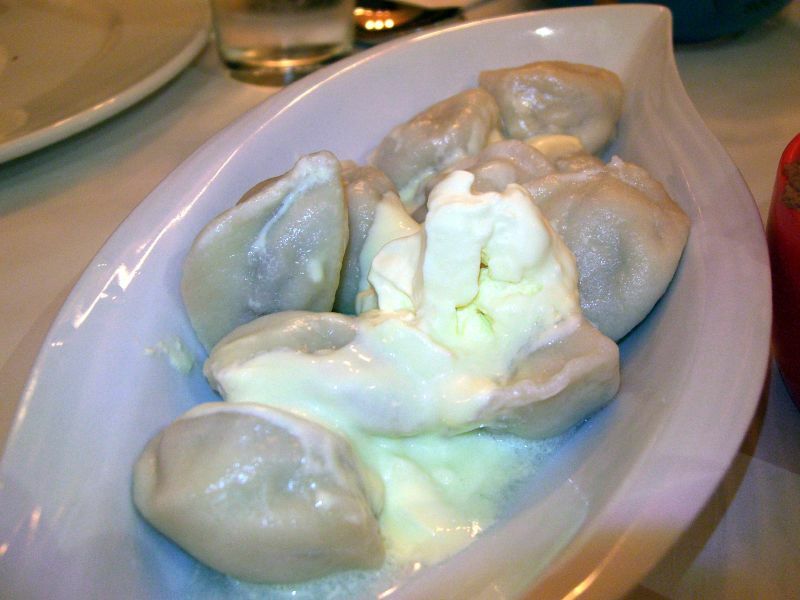 Manti are cooked in a multi-level steamer and served topped with butter, sour cream, or onion (or garlic) sauce. When sold as street food in Kazakhstan, manti are typically presented sprinkled with hot red pepper powder. Left: Kazakh or Uzbek manti in a steamer. In Kyrgyz cuisine, manti are usually made of one (or a combination) of the following ingredients: lamb, beef, potato, or pumpkin, with fat often added to meat manti. Steaming, frying and boiling are all common. Manti are usually topped with butter and served with sour cream, tomato sauce, or fresh onion rings (sprinkled with vinegar and black pepper). A sauce made by mixing vinegar and chilli powder is also common. 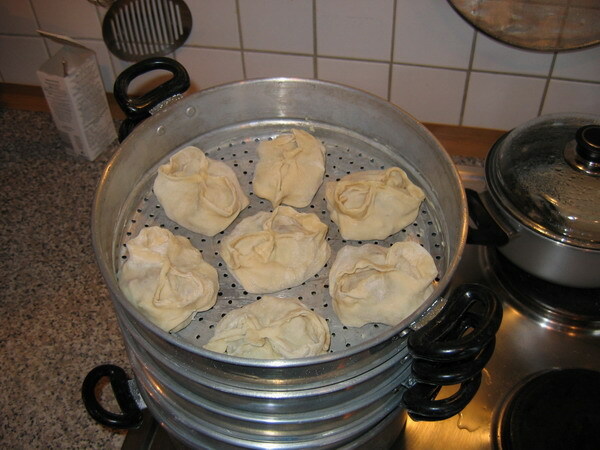 Time and energy-consuming, the preparation of manti is often a family activity.